Empathy is the understanding of or sensitivity to others feelings and experiences. It is a developing trait across childhood and can greatly vary between children based on age, predisposition and experiences. There are several ways parents can coach the component pieces of emotion language and perspective taking. Coach Emotion Language – Children being able to identify emotions in facial expressions, social context and in themselves is a strong foundation for empathy towards others. Here are several ways to coach emotions. Talk about others’ emotions – Discuss the sad baby you hear crying in the grocery store or the angry child who was having a fit at the playground. Label emotions, talk about things that make them feel that way or what others could do to help. Be sure to include causes and consequences of emotions – At least occasionally in these conversations, discuss what came before the emotion or what happened as a result. Read about emotions – There are so many good children’s books on emotions. There is a list on my blog at https://parentingbydrrene.wordpress.com/childrensbooks/#emotions. Tell your own stories with emotional content – If you are at all creative, tell your own stories with emotional content. When our girls were little, we told a lot of Amy and Catie stories. Amy was remarkably like our daughter Alicen, and Catie just like our daughter Claire. If Alicen and Claire had an upset at the swingset, that night Amy and Katie would have a similar upset at the sandbox. Your stories should all provide examples of positive ways to manage and express emotions and ways to calm. Ask hypotheticals – As children are four and five years old, you can ask hypotheticals related to their own experiences. If your child gets angry over sharing toys, you might ask, “what would you do if you really wanted to play with a particular car, and your friend was using it and kept saying ‘no’ to giving a turn?” If needed, help brainstorm good choices and discuss possible outcomes. Role play emotions – Go back and reenact emotional situations. If it was an upset with another child, take turns being each child involved and think of ways it could have gone better. Give puppet shows – Most kids love a puppet show. Again, it’s good to make these about familiar exchanges. Play emotion charades – Play charades, just be sure to include emotions as a category. Make emotion faces in the mirror and to each other – Talk about how we know someone is angry, excited, sad or happy. Make an emotions poster – Divide a poster board into 6 squares labeled happy, sad, excited, mad, surprised and scared. Provide assorted magazines, then help children cut out and paste emotion faces and things that make them feel each way. You might write in each box additional things that make them feel that way or any other thoughts they have about that emotion. Listen to and discuss emotional music – Listen together to sad, exciting or happy music. Then, talk about what each song makes them think of and how it makes them feel. Paint emotion pictures – You might paint emotion posters while you listen to the emotional music. Sing emotion songs – We sing “When You’re Happy and You Know It” and include movements like clapping for happy, stomping feet for mad and crying for sad. Learn more – For more ideas, you can read Building Emotional Intelligence: Techniques to Cultivate Inner Strength in Children by Lantieri or Parents’ Guide to Emotion Coaching Young Children by Blaine. (Again) Provide Empathy for Their Emotions – The more they are hearing the labels for their own emotions, the more likely they are able to apply this language to others. Empathy is often a good place to start in a discipline exchange or when helping them learn to manage social conflicts. Just acknowledging emotions as they are, lets the child know that you hear and understand them. Remember, it’s often empathy before the discipline or empathy before the fix. Coach Perspective Taking – Perspective taking is being able to see a situation from another child’s point of view. This is limited in the preschool years. Young children are often still so egocentric in their view, it is hard to step out and consider another’s experience. You might introduce this when you and the child are disagreeing or feel differently about the same topic. At bedtime, maybe talk about how you are happy and looking forward to sleep and they are annoyed and wanting to put off sleep. You might point out differing feelings or opinion as part of addressing when they are in conflict with another child. Children’s Books – Reading and discussing books can be a great way to teach social skills. Schedule Playdates with Younger Children – Occasionally playing with a younger child can bring out caring and empathy from an older child. You might label emotions when they happen. You might suggest the older child help the younger child with tasks or teach them how to do something. You might highlight how considerate or helpful your older child was after the playdate. Provide Do-Overs – When it seems appropriate, it may be helpful to allow the child a do-over, a chance to improve their behavior or make a better choice instead of always giving a consequence. The do-over allows the child to really consider alternatives ways to change outcomes. Highlight Deeds as Personal Traits – I’ve written often about using descriptive praise. When you are praising a child’s behavior, academics or athletics it can be helpful to describe the behavior and label. This may be “You handed a block. That was helpful.” Or “You wrote five sentences. That’s a lot of work!” There is new research to suggest it is helpful to occasionally highlight their trait rather than give a straight label. This would be “You handed a block. You are being helpful,” or “You are a helpful person.” And “You wrote five sentences. You are a hard worker!” Highlighting the trait may give the child more personal ownership. It may be more likely they carry that self descriptor with them to influence future behaviors. They may be more likely to think of themselves as a helper or a hard worker. When it comes to encouraging empathy, it would be commenting often about how kind, considerate, thoughtful or friendly they are. Does your child get anxious, angry or frustrated easily? In the moment, it’s often best to err on the side of support; rather than, challenging or giving logic and reason as an answer to their emotion. It’s often helpful to acknowledge the emotion, provide empathy and give time and space to let a child calm down. It can also be beneficial to spend some other time teaching them ways to settle. Many of these techniques offer the child a distraction from the upset or anger which can be enough to help them start to calm. Best to teach these things out of the moment – Don’t wait until your child is freaking out to try teaching them how to take deep breaths. When people are angry or upset, they aren’t in a good place to learn something new. It’s far more effective to teach new skills or introduce new ideas when they are calm, or when all is well. Make a calm down spot, an alone zone, a content apartment – In our house, this was a corner of the living room stacked with a few bean bags, pillows and favorite stuffed animals. A mom said her son liked a cardboard box with a door cutout and flashlights inside. The idea is to make a space that is inviting for your child, and is known to be a good place to go to calm down. This space shouldn’t also be tied to discipline or used for time-outs. Make a few calm down boxes – Fill a few empty shoe boxes with small, quiet toys. This might include lacing boards, invisible ink books, or matchbox cars. We had a few boxes filled with felt board story pieces. You might hand your child a box when they need to calm down or keep a stack of boxes by your calm down spot. Art, drawing even scribbling – In addition to calm down boxes, you might provide art supplies. Many people find painting, drawing or even making things to be calming things to do. If your child finds this helpful, it’s good to openly provide supplies and encourage their use. Deep breathing – This is the simple one, and it can be so helpful if your child buys in. In our house this was counting five slow, deep breaths and then focus on breathing in a regular way for a few minutes, then another five slow, deep breaths and regular again then repeating until you feel calm. For a younger child, you might provide breathing shapes. This would be cutting out construction paper stars and putting a dot in one corner. Teach your child to start with the dot and take one deep breath for each corner. Others suggest it may help to describe deep breathes with a flower and candle. This is taking a deep breath in through your nose like you are smelling a flower, and then out through your mouth like you are blowing out a candle. Counting – Counting can be enough of a distraction task to give your child a chance to calm down. This might be counting slowly to 10, or counting backwards from 20, or counting as high as they can by threes or sixes. The idea is to either slow them down or give them a slight challenge to get them thinking. As an alternative, it can be helpful to inventory something. This might be counting ceiling tiles or number of people in a crowded area. Visual counting -This one can take several practices before it’s useful in the moment. First, help your child pick a favorite activity or sport. Let’s say it’s soccer. Then, instruct your child to close their eyes and imagine themselves kicking the soccer ball down the field and into the goal. Have them keep their eyes closed and picture it once for as many years as they are old. For a six year old, they’d picture making six goals. After a few practice rounds, let your child know that when they are getting angry or frustrated it can be helpful to close their eyes and count their soccer goals. Think of a favorite time or place – An easier visualization task may be to have them close their eyes and think about a favorite vacation or time at their favorite playground. Again, practice a few times and then recall this in the moment. Mantras – My own mantra is, “breathe, breathe, breathe…”Whenever I am stressed, just reminding myself to breathe and focusing on each breath is helpful. A parenting mantra might be, “no one goes to college NOT potty trained,” for that difficult stretch of time. A child’s mantra might be as simple as, “I’m okay, I’m okay…,” or, “I can do this, I can do this…,” A mantra might follow one of the other suggestions like, “let’s just count, let’s just count…,” until they can get themselves started. Get physical, run, swing or dance – Movement is calming for lots of people. This may be repetitive movement like swinging, or more physical exercise like running or climbing. It’s great to give kids movement opportunities often and movement outlets for their negative emotions when needed. Muscle relaxation – There are a few mucle relaxation clips for children on youtube including relaxation: clip 1 and clip 2. Once you get the hang of it, this is something you can walk your child through, or they can do it by themselves. In our social skills groups we play a few related games including Melting Snowman and Tin Soldier. We start off as ice-cold, frozen snowmen. Then, the sun comes out and ever so slowly the snowmen melt until they are just puddles on the floor. For tin soldiers, we sit as upright as we can with our arms and legs and back held straight out. Then, we turn into ragdolls and flop on the floor. The idea in both is to end up relaxing your whole body. Yoga (gymnastics, karate, ice skating) – If a child enjoys these activities, it’s good to encourage them to continue. While the movement itself can be relaxing, there’s also the long term benefit of children learning to control their bodies and be disciplined to practice. Fully describe something – Describing something is another way to distract from an upset. This means looking around the room and finding something to fully describe to yourself for a minute. This might be a painting or a toy. Focus on solutions – Focusing on solutions can be calming to anyone. If I am frustrated by how messy my house is, and I continue to focus on the mess and who made it or how they don’t help, I am just upsetting myself. It can be calming to make a plan for cleaning, and make decisions about how it should look in the end. For a child who is angry about how a game is going, this is getting them to focus on the solution, how to best resolve it. Even better if they can brainstorm and come up with a few options for solving. Music – Listening to a favorite song or happy music can be a way to help children calm. It may be useful to have them build a playlist and keep it handy. Mindfulness – This is teaching children to stay present and to let go of worries about the past or anxieties about the future. It’s slowing down and being aware of your feelings. Here are a few fun ways to get started: midfulness clip 1 and clip2. This may include meditation. Here are a few links to meditation ideas for children: meditation clip 1 and clip 2. Model apologies – Young children learn best through modeling. When you are in the wrong about things, apologize to them and others easily. If they see and hear you being comfortable with apologies, they are more likely to follow suit. Suggest and encourage apologies – I have read that others suggest we not encourage young children to apologize, because they don’t know what they are saying, they don’t understand the meaning of, “I’m sorry.” While I agree, young children don’t often understand the full meaning, I chalk up encouraging them to say, “I’m sorry,” to a general social grace. We do encourage young children to say, “please,” and, “thank you,” and, “excuse me,” which they also don’t understand. I think it’s fine to encourage them to build good social habits. Give choices about how to apologize – Once your child is five years old, I think it’s fine to offer choices such as writing a note or drawing a picture to apologize. You might offer choices of apologizing now or in a few minutes, saying it out loud or whispering it in someone’s ear (provided that the receiver is agreeable). Give time to apologize – It can actually be helpful to the situation to give kids a few minutes to calm down and collect themselves. They might take a minute to think about what happened and decide what to say before apologizing. Say it – Saying, “I’m sorry,” is the first part of an apology. It’s great if it’s heartfelt and honest. It can be dismissive if it’s just thrown out there, or worse, yelled at another child. Feel it – Feeling sorry for what you’ve done is the next step. You might ask your child to think about how they would feel in the other child’s position. You might discuss how they feel now about what happened and about having to apologize. You might touch base after and talk about how it feels after an apology. Do something to make it better – Making amends is another important step. This might be helping a friend hold their ice pack on a related injury or helping rebuild the block tower that was knocked down. Forced apologies happen in one of two ways. Either the child is angry and resists having to apologize, or the child is embarrassed and hesitant to apologize. In both cases, the child’s own negative emotions often get in the way of developing a sense of empathy. If your child is angry and not feeling sorry about what happened, and you force the apology, the result is predictable. 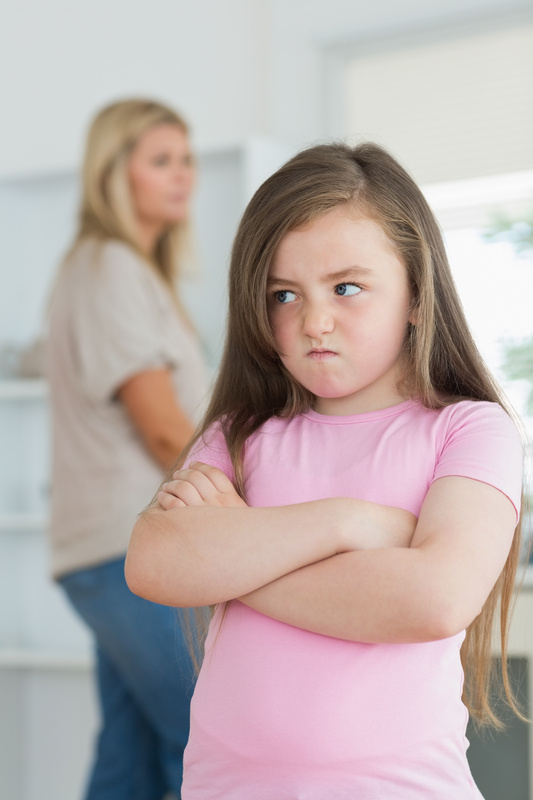 Your angry child likely will storm over to the other, bark, “SORRY!” at them and leave abruptly. Rather than teaching your child to feel empathy, this situation seems to provoke feelings in the opposite direction. Your child may actually resent the other child more for his role in this interaction. The resentment overrides any developing empathy. Your child also learns that saying sorry, even if he doesn’t mean it, is enough to fix a wrong-doing. If your child is embarrassed by the idea of having to apologize, but is forced to do so, the result differs but is just as predictable. With a push, your child may slowly approach the other child and then quietly say, “sorry,” while fighting back tears. Empathy requires the child to focus on the thoughts and feeling of another. When a child is embarrassed, he is thinking mostly of himself which inhibits the development of empathy. 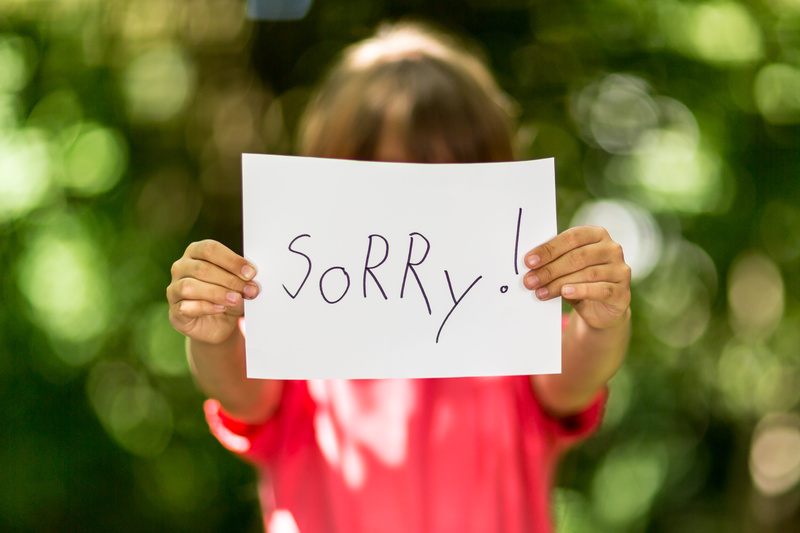 Rather than force an apology from an angry or embarrassed child, you will have more success building a sense of empathy and teaching the language of sincere apologies through modeling. In the case of anger, take your child with you and say something like, “I am so sorry he did that. I would like to make it better.” Here, the parent is speaking for himself. The parent is sorry, the child is not. In the case of embarrassment, take your child with you and say something like, “he is so sorry. He would like to make it better.” The child actually is sorry, just reluctant to address it. Your child will have the benefit of hearing a sincere apology and optimally will be better able to focus on the feelings of the other child rather than his own. When children are tantrumming often, parents just want it to stop. Part of stopping tantrums is working to prevent them in the first place. Teaching your child emotion language and knowing their triggers and cues can go a long way towards prevention. Children need emotion language to better express their upsets. When they can label their emotions and talk about why they are feeling that way, they are much less likely to fall on the ground kicking and screaming. When they can say, “I am mad! I didn’t like that!” in the moment, they are less likely to tantrum. There are MANY ways to teach children emotion language. Learn more – For more ideas, you can read Building Emotional Intelligence: Techniques to Cultivate Inner Strength in Children by Lantieri or Parents’ Guide to Emotion Coaching Young Children by Blaine. You can also attend or listen online to my workshop on emotional development and emotion coaching. Triggers are what sets your child off. Tantrum triggers fall into three categories including situational triggers, social triggers and parent stress level. Knowing what sets your child off, allows you to see it coming in the moment and to teach your child how to better manage out of the moment. Situational triggers – Situational triggers include the child being hungry or tired. As a parent, this one falls on you to stay ahead of or fix. If you child tantrums from hunger, carry crackers in your bag and feed them healthy snacks more often. If your child tantrums from being tired, look at their sleep in the 24 hour period, check their nap schedule and build quiet time into their day. Social triggers – Social triggers are harder. This is a child that tantrums over having to share toys, being told “no” or not being first at something. The answer here is to teach your child how to better move through these moments. If the difficulty is over sharing toys then read and discuss children’s books about sharing, role play taking turns, tell stories or give puppet shows about sharing and taking turns, draw pictures of it going well and then coach them through it in the moment. Avoiding the trigger doesn’t work. If you end all playdates because your child falls to pieces over sharing, then your child loses the opportunities they need to practice. Parent stress level – This one can be hard to see. When parents are particularly stressed, children tend to tantrum more. It may be that they are reflecting the level or tone of emotion they feel in the house. It may be that because you are stressed, you are preoccupied. When you are preoccupied, you might not be as in touch as you usually are, and they have to get bigger and louder to get your attention. When you are stressed, do you seeing them rubbing their eyes, or do they have to be dragging on the floor to see they are tired? Do you recognize their frown, or do they have to be sobbing to get you to see they are sad? If they have to be dragging or sobbing, they will likely tantrum more because you are just not paying attention. This can often be tied back to your stress level. I’m not saying be super-parent and never feel stressed, just recognize when you are and the role it might play. Cues are signs your child is about to lose it. Some kids do go zero to sixty, they are walking along and then BOOM, they are on the floor in full-tantrum. Most kids though, do give you a warning or a cue. Sometimes they are generous and give you a few minutes notice, other times it’s just a few seconds. The trick is to recognize your child’s cues and then intervene when they happen, before the tantrum. Some kids get fidgety, others get whiny or loud. It could be as slight as narrowing their eyes or their shoulders getting tense. There are several ways to intervene that may avoid the tantrum. Distraction – Distraction, before the tantrum, is fine while it works. For most kids, at some point, this just doesn’t work. While you are using distraction in the moment, you still want to be teaching emotion language and teaching them ways to better manage when the triggers happen. Empathy – Giving empathy means you validate your child’s emotions, even when you disagree with those emotions in the moment. Let’s say your four-year-old loses at a game and throws the pieces across the room, denying their emotions (what you want to avoid) would be saying, “you shouldn’t be so angry, it’s just a game.” Giving empathy (what you want to do) would be saying, “wow, you are angry! You didn’t like that game.” This validates the emotions, and lets them know you understand how they are feeling. There are so many beneficial reasons to start with empathy here, at the top is that it helps many children start to calm. If you don’t know your child’s triggers or cues, you might want to chart their behavior. Charting behavior can be helpful anytime there is repeat behaviors such as lots of tantrums or many aggressive acts. Charting is easiest if you keep a notebook. Give each tantrum one page and on each page make a template. This includes noting where it was, when it was, who was around, what seemed to set it off, any cues they were about to lose it, what happened during, how long it lasted, how they found their calm and what happened after. Once you have notes on several tantrums, you might be able to read through the notes and find patterns. You might realize that your child is always tantrumming around 11:30am, maybe it would help to move lunch earlier. Maybe your child is tantrumming when other children are playing together, and he feels left out. You might role play or read books about joining play. Do Your Children Get Silly When You Are Angry? Children can easily feel overwhelmed by other people’s emotional displays. This is especially the case if they feel responsible for the other’s negative emotions. This is often the set-up in a parent-child discipline exchange. 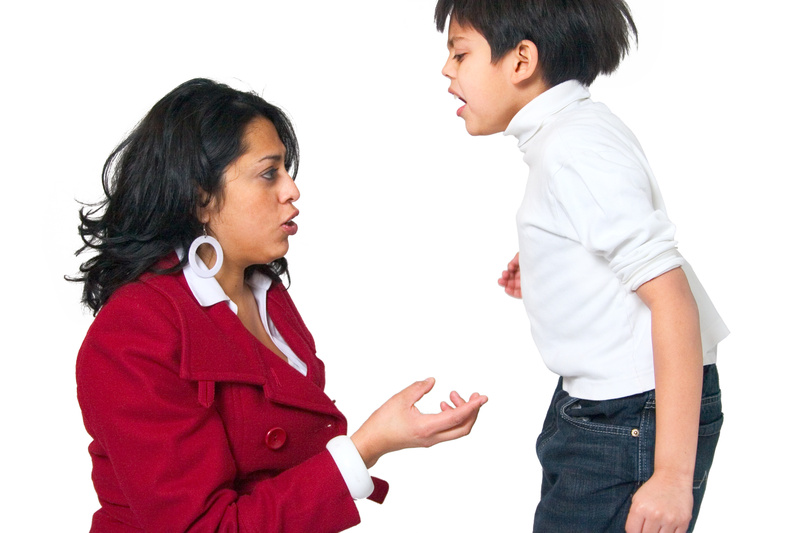 Child misbehaves, parent feels angry, child feels responsible for parent’s anger. When children feel overwhelmed by other’s emotions, a natural defense mechanism is to get silly and play. In this moment they are trying to diffuse the situation, to distract from the anger. It tends to be a pretty poor way to diffuse, usually it tends to fail. Let’s say your arms are full of groceries, you are trying to get the kids in the car and your four-year-old is running circles around you. Next thing, they knock groceries out of your hand. You bark, “get in the car!” Your face is red, and your voice is angry. Your child feels overwhelmed, so a natural defense mechanism kicks in, and they get silly. They laugh and run off saying, “you can’t catch me!” They are trying to change the situation, to calm things. Unfortunately it’s a very poor choice for getting to calm, being silly tends to kicks things up a notch. The trick is to recognize the pattern for what it is. If your children get silly and play in response to your upset, at least consider they may be feeling overwhelmed and trying to diffuse your emotion. Take it as a signal to calm. Once you’ve learned the steps of positive discipline, there are a few guidelines for using each. Empathy is for when the children are expressing negative emotions. The empathy, as needed, comes before the discipline or the fix of the situation. The general idea for emotions is to consider on the way into a discipline exchange if either of these techniques are needed. Positive intent is helpful in every exchange. While you don’t have to always say it out loud, the rule is at least think it every time. Choices come before consequences for all behaviors except aggression. Aggression may work backwards. If choices aren’t working, you can substitute challenges or jobs here. Natural consequences become fair game at three-and-a-half or four years old. Remember you aren’t stopping behavior, you are allowing the child to think through this and make a decision about the behavior. Occasionally, it may be that you state a natural and then follow up with a logical consequence. Logical consequences are meant as an endpoint in discipline. Positive logicals work more like choices, often with a more agreeable outcome. Negative logicals may be met with upset, but that likely means your consequence is meaningful (provided you didn’t go too big with intensity). In real life, you wouldn’t use all of these steps at one time. Most often, parents use a few of the steps in combination to work through an exchange. The best plan is to spend time focused on using each step, get comfortable with it and figure out which steps are most comfortable for you and work well with your child. These steps are meant to be used in conjunction with proactive techniques and coaching good behaviors. Empathy is the child’s ability to recognize and understand another’s emotions. This is a gradually developing trait throughout the childhood years. While young toddlers may react to others’ emotions, their ability to understand those emotions or recognize the other person is having a separate experience is limited. To support their growing sense of empathy, parents and teachers can teach about emotions and perspective taking. The goal by kindergarten is to have a child that can use their words to express emotions, and to be able to express emotions in ways that don’t get them into trouble. To meet this goal, the child needs a lot of emotion language input. A few goals are that by two and three years old the child should be able to label emotions, by three and four identify emotional expressions, and by four and five talk about causes and consequences of emotions. Right along with this is teaching them ways to best express and ways to calm. Two year olds are almost entirely egocentric in their view. By five and six years old they are often better able to see another’s viewpoint. An easy way to teach perspective taking is through children’s storybooks. Children are used to talking about the characters and plots in their storybooks. To introduce the idea of empathy, stop and ask questions about how the characters are feeling or what they are thinking and why. With older children, discuss how different characters might feel and think differently at the same point in the story. Another way to teach this is to point out others’ perspectives often, especially when there is a disagreement. With a three year old, this might sound like, “look at your friend. He is sad, he didn’t like that.” As they are older, you might question their understanding. With a six year old, you might ask, “how is your friend feeling now? What happened that made him feel that way?” The more they can reflect other’s emotions the better. Following an upset in her bedroom, an older daughter storms into the kitchen saying, “I hate her! She is always ruining my stuff!” Unfortunately, common parent responses include giving logic or reason, “she is younger than you, you have to be patient,” or a demand, “she is your sister, she is going to be your best friend in life,” or, “we are a family of love.” Worse yet, parents might deny the emotion overall, “you don’t hate her, you love her.” All of these responses teach the older child to bottle emotions, teach that her emotions are wrong and give her something to argue about. These responses let her know that you don’t understand. it’s better in these moments to understand her emotion, give empathy and validate her emotion. This would sound like, “wow, you are mad at her! You don’t want her in your room.” The parent is labeling the emotion and letting the child know she is understood, that her emotions are her own and they are important. The child feels connected and can safely express herself. She can move forward from the emotion, rather than have to hang on to it and argue. I am not saying you have to allow the word “hate” or let them scream negative things at each other day in and day out. You can follow-up by curbing the words as you would behavior. After you’ve given empathy, and the situation has calmed, it’s fair game to loop back by saying, “I know you are mad. When you are mad, I need you to find a better way to say it.” Then talk with your child about better ways. You might curb the language moving forward with, “those words are too hurtful. If I hear that again you will be in separate rooms.” Also, it’s good to spend time with both children addressing the specific behaviors at hand. This may be coming up with house rules about being in each other’s rooms, or setting aside time when they play separately each day to give them a bit more elbow room. If you want to learn more about sibling relationships, there is a great book titled Siblings Without Rivalry by Faber and Mazlish.